Vulcan socialites, secrets, prejudices. Can infinite diversity in infinite combinations persist? 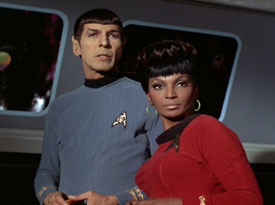 On a visit, Spock & Uhura discover that New Vulcan is not only a difficult place to fit in, it may hold danger for Sarek. As outsiders, can they uncover a plot and maintain their bond? S/U,Kirk, OCs, Scotty, Enterprise crew members & Gaila in later chapters. Fluff, Emo!Spock, some bad language. Draws upon the TOS Star Trek episode, "Journey to Babel" by D.C. Fontana. Nyota falls ill on an away team mission on a snowy planet. Spock relies upon his crewmates to help his beloved recover. Meanwhile, a blizzard gives the Enterprise away team an unusual variant of cabin fever. Kirk, Bones, OCs, and a wee bit of Scotty near the end. This story references the TOS episode Shore Leave, written by Theodore Sturgeon, and there are many other TOS references. Fluff, purple prose, Emo!Spock, romance/humor. Complete. So a Vulcan never forgets? After a risky mission, Spock seems...different, and Nyota is worried. Multi-part drabble inspired by the talented linstock's lovely, intimate fanart titled Yin and Yang. See the original on her LJ page or as a post in the Spock/Uhura group. Warnings: Sweetness, Emo!Spock. 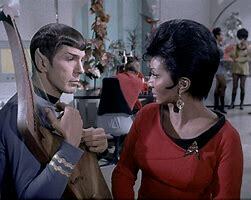 Early in their courtship, Spock invites Nyota Uhura to dinner while they are in a large city. Rating: a mild PG for flirtation and fantasies. This drabble is based on a picture prompt posted by linstock to the Spock/Uhura LiveJournal group. The image was an altered still of a young, handsome Leonard Nimoy dressed as a street thug in a late 1950s/early1960s TV show episode. His hair hung over one eye, and he wore a black leather motorcycle jacket and T-shirt. Linstock altered the image, adding pointed Vulcan ears and changing his eyebrows. Even Spock needs a little comfort. 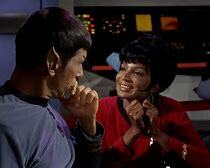 Nyota wants to make Spock as happy as he makes her & befriend her prospective father-in-law Sarek. She's a brilliant translator, but can she balance living between multiple cultures? Mature rating in final chapter. Fluff. 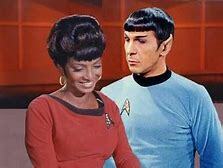 What happens when Spock can't get Uhura out of his head.